We welcome you to St. Jude’s Catholic Primary School, a happy and caring school where every child is known and loved. We are pleased to have this opportunity to share with you some of our beliefs and aspirations, as well as general information about our school that you might find helpful. This website, which is a window into the life at St. Jude's Catholic Primary School, will give you important information about us. It is designed to provide for you a whole range of details concerning the curriculum, school development, personnel, our Governors and many other aspects of school life. 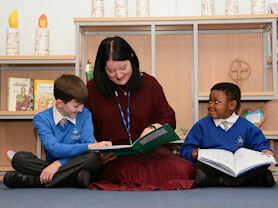 Here at St. Jude’s we do our best to challenge and support all our children so that every child has the opportunity to excel and achieve their potential. As a team, we endeavour to provide a rich, exciting and diverse curriculum so that each child can experience a varied yet stimulating education within a small and homely environment. Our mission indicates our intimate approach of creating a spiritual haven where our children can grow and flourish in a loving and homely way along a path that Jesus wants us to take. We believe that every individual is made in the image of Christ and set out to see each pupil as unique and highly valued in our community. All our children strive for success and happiness encouraged by a committed staff, who by knowing and loving each child, provide wonderful opportunities to enhance their development. Standards and expectations are high for our pupils so that they can all reach their potential and be the best that they can be. We are proud of the progress our pupils make in their time here and aim to maintain continued academic growth and success. We look forward to working with you and your child as they embark upon the next stage of their learning journey, as we work together in Faith to challenge, support and prepare our children as future citizens of this 21st century.